A month after I started my blog Bev Sansom posted a comment wanting to know how Asian stocks are made. I was pleased to know that readers like Bev are interested in proper cooking techniques. I am a great believer in mastering techniques, be it Western or Asian cooking. Chinese cooking techniques are often misunderstood, and rarely presented with thorough research and clear instructions. So when I started to put together a post for stock making I consulted Chinese cooking sources such as textbooks from professional cooking schools in China and Chinese language cookbooks. What started out as a quick study of stock making, turned into a quest for complete understanding of this very sophisticated aspect of Chinese cooking. But fear not! I’ve simplified and condensed the different techniques for you. 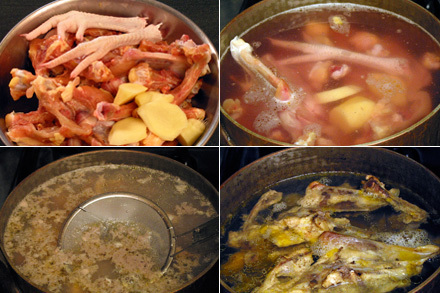 Making stock is one of the most fundamental and important techniques in any cuisine. In Chinese cuisine the most important types of stock can be divided into single meat, mixed meat and vegetarian. Single meat stock is made from one type of meat such as chicken, pork, duck, or fish. Mixed meat stock is commonly made from combination of fresh meats plus cured meat, such as ham. And finally vegetarian stock is made from soy, mushroom and other aromatic root vegetables such as radishes. The selection of ingredients for Chinese stock often depends on how it complements the ingredients in the final dish. For example, chicken stock is used for enhancing very delicate seafood dishes such as shark’s fin and sea cucumber, a mixed meat stock is used for a winter melon soup, and a fish stock is used for a fish stew. 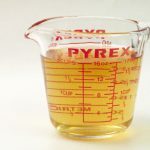 Each of the three types of stock can be further classified as clear or white depending on the level of heat used during preparation. When the stock is prepared on medium heat where the liquid is boiling throughout the cooking time the resultant stock is creamy white in color. In Chinese this stock is called white stock (白湯). On the other hand a clear stock (清湯) can be made by cooking the liquid on very low heat to gently simmer the stock. The ultimate type of Chinese stock however is known as supreme stock (上湯). This stock is commonly used for such luxurious delicacies as braised abalone and braised shark’s fin. The method for making supreme stock is to add chopped meat into already clarified clear stock and further simmer on low heat. This supreme stock is so full of flavor it’s like adding MSG to a dish when used, but naturally. Similar to Western stock making a common set of aromatics are added into the stock. Instead of the trinity of celery, carrots and onions in Western cooking, the Chinese stock requires ginger, scallion and Shaoxing cooking wine. A few English language sources suggested the use of garlic in the stock as well. Personally I do not recommend this practice because the garlic flavor will dominate the resulted stock. Garlic should only be added to the final dish to impart its flavor. Now I’m ready to show you how to make clear stock (清湯). For other types of stock I will publish in future posts. Clear Stock can be made from many different kinds of bone. Use fresh uncooked chicken, pork, beef or lamb bones. The method and aromatics are the same. Always start with cold water when making clear stock. Put all the ingredients in a large stockpot over high heat until the water starts to boil. Immediately reduce the heat to low so the liquid is just barely simmering. Skim off the scum that forms on top of the liquid. Continue until there is no more scum. Simmer covered for about three hours. The stock will become very clear at the end. Use cooking tongs to remove the solid ingredients. Then strain the stock through a cheesecloth or very fine sieve. 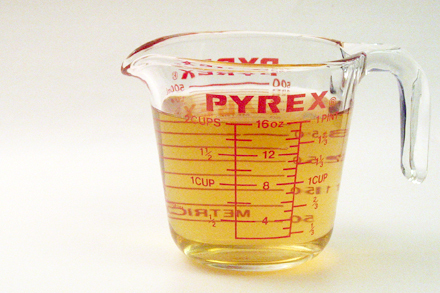 You can now use this stock for any dish that calls for a clear stock. I have never seen instructions on making clear broth before (maybe it’s just another thing I can’t remember!) – thanks for posting. But I have a question for you: I can’t get chicken bones often enough to make the amounts of chicken stock I want, so I often cook whole chickens – OK, here’s my question, what do you do with the chicken meat left in the pot? I’ve seen some purists who say,”Throw it away because you’ve just cooked all the nutrition and flavor out of it”. But I also hear some say, “What a waste of meat! Use it for whatever.” Frankly, I kinda agree with the former because flavorless chicken is like eating cardboard. What do you think? I’m glad you are interested in proper stock making techniques! To answer you question I’d agree with your comment on throwing out the meat. It does sound wasteful but there really is not much left on the fibrous meat, nutritionally and taste-wise, after cooking for such a long time. For making Western cooking stock I often use carcasses from roast chickens. Whenever I make a whole roast chicken I’d save the carcass after carving off the breast meat. For Chinese stock I use uncooked fresh chicken bones. I usually go to Chinatown markets for them. You can often find fresh chicken bones in other ethnic markets as well. If you are unable to get fresh bones in your local markets and are adventurous, then buy whole chickens and debone the meat at home. You can use the bone and the meat separately. Great post. As the food writer for AsianWeek and writer for food blog (Campusblog), I must thank you. As a 30 year old Asian American, your post has helped me not only extend my knowledge on stock but preserve Chinese cooking. I left Hong Kong when I was five. Without being able to read Chinese, there are not many sources to learn about traditional Chinese dishes. keep writing. I also like your frank bio. Any tips on de-oiling the stock? Refrigerate the stock. Then just scoop off the fat with a spoon. Hello Kian it’s me again, if I wanna make a simple soup what could I add to the soup like what Chinese vegetables would go good or if I wanted to make a chicken soup with chicken meat and veggies? Nathan, Chinese soups, especially Cantonese, are usually made with various herbal ingredients, resulting in very flavorful herbal broth. I would suggest using dried shiitake mushroom, bamboo shoots and ginger in a chicken soup. I have seen stock recipes that boil the bones first then dump the water, wash and then add the bones to fresh stock water. I thought this was the Chinese way of getting rid of the scum. I have made it this way once making Pho. Making western chicken or beef stock I just skimmed. To boil, to skim or, no difference? 1) I’m afraid I don’t know “fortune chicken soup.” There are many herbal soups that call for young chickens. My understanding is that young chickens retains tender moist texture even after long simmering. 2) For a clear fish soup you want to simmer the stock on very low heat. The reason for this is so the stock will remain clear. However there are fish soups that calls for a “milky” stock. This stock is most commonly made with fish bones and cooked over very high heat. I believe cooking the fish bones in boiling liquid releases the milky particles from the fish protein. 3) For a clear soup I recommend using regular grade tofu. For a thickened soup I would use soft tofu. So if your recipe calls for clear fish stock I would use regular tofu. thank you for this – we’ve just moved from Singapore and your site has helped us when create dishes that remind us of home! I always boil a whole chicken to make White Cut Chicken (白切鸡). After the meat is used for that meal, I throw everything back in the pot and boil for 3 hours to make stock. That way, you are most definitely not wasting the meat! I have the same question as Richard. My family says I have to parboil the meat before putting it in into the cold water that will eventually turn into soup. But I don’t see the parboil step in your recipe. Is it necessary? When making a stock what you need to do is to simmer over very low heat, which will result in clear flavorful stock. Generally you don’t have to parboil the meat or bone for making stock. At low temperature the impurities will clump together and can be easily skimmed off. But when you are making a braise, stew or soup, then the meat should be parboiled. Doing so will allow you to skim off any impurities before adding to the actual aromatic liquid with spices and sauces. All these steps will ensure that the resulted dish or soup will be clear and appetizing. The parboiling process is beneficial in many cases. In Cantonese it is “fei sui” (飛水) (Jyutping: fei1 seoi2). It removes a great deal of the blood and scum and associated stuff before preparing the stock proper with fresh water in a fresh clean pot. I myself usually don’t do more than rinse the cut-up chickens or chicken carcasses in several full pots of water, to remove some of the blood and “float away” some of the junk; and also often skip the “fei sui” treatment with pork spare ribs. But with beef bones – such as for making phở stock – it is often a very important step. I once made phở from scratch for a friend of mine, who had never parboiled her bones before making stock – and hung on to the water from parboiling the bones, whilst going on to prepare the stock proper from the cleaned bones (which are definitely rinsed and lightly scrubbed under the tap) in fresh water. I asked her to smell the parboiling water, and the stock-with-fresh-water being simmered — and the look on her face was (as the Mastercard ad says) – priceless. The parboiling removes much of the detritus as well as the “bloody smell” (and taste). The stock-proper with the parboiled bones has a MUCH “cleaner” taste. Thank you for your comment! I am so glad to hear the endorsement of par-boiling bones and meat before stock making. Yes, this is a very important step for Asian cooking.